The Germans established factories in the ghetto and Jewish residents for forced labor. By August 1942, there were almost 100 factories within the ghetto. The major factories produced textiles, especially uniforms, for the German army. 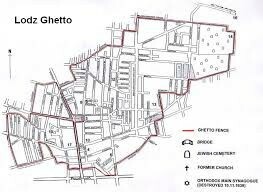 More than 20% of the ghettos population died as a direct result of these harsh living conditions. Chairman of the Jewish council in the Lodz ghetto, hoped to prevent the destruction of the ghetto by making it as productive as possible. He gambled that Jewish labor essential to German factories would spare Jews from eventual deportation and preserve the Lodz ghetto until the end of the war. 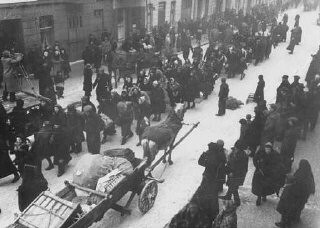 Jews deported from Germany and Austria march towards the Lodz ghetto. Lodz, Poland, October 1941. 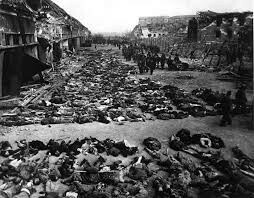 During World War II many Jewish men,women,and children died from starvation,disease,and were killed by Germans, September 2, 1945. Jews carrying their possessions during deportation to the Chelmno killing center. Most of the people seen here had previously been deported to Lodz from central Europe. Lodz, Poland, between January and April 1942.